I had an opportunity to demo my friends Airush Sector 60 V1. After riding the board in varying conditions from 9-13 knots (Airush 12 m Lithium) to 18-20 knots (Airush 9 m Lithium) I understand the Sector's popularity. It's a unique fun board. I primarily ride surfboards (Airush Cypher 5'6 - Naish Global 5'7 - North Skimfish) so it didn't take long to adjust to. Just have to remember to watch out for those impressive fins when barefoot and waterstarting. Ouch! Ok back to my story...I heard the term used "kite sailing" when describing the Sector. I agree. It's the perfect board for cruising, but as most Sector owners know it's much more than that. All said, I'm buying one. For my weight of 158 lbs - 71 kg, the 60 is more board than I really need. I'm leaning toward the 54 V3,V4, or V5. Besides I'm not interested in riding in anything much below 10 knots and realize this board would be pretty cool in medium to stronger winds, small mushy surf too. Ok lot's has already been said about the pro's and con's of this unique design, so I'll address the title of my post. Weeds! I kited at Revere Beach (@ Boston, MA - USA) in 9-13 knots / onshore winds / 12 m Lithium. I got off the beach no problem. The board planed up at full speed for about 10 yards...Then little by little she began to slow down. I was still planing mind you and was still able to maintain upwind drive. Impressive. I would go as far as I could until the board slowed to a crawl, then I'd drop into the water clear the fins, get going again - repeat. The weeds were tough on everyone, even for the guys on the surfboards - surf fins weren't immune. I know weed fins can be had for the Sector, but I've heard mixed reviews on their performance. From my windsurfing days, when weeds fins were sometimes mandatory where we sailed, I discovered some weed fin designs worked better than others. 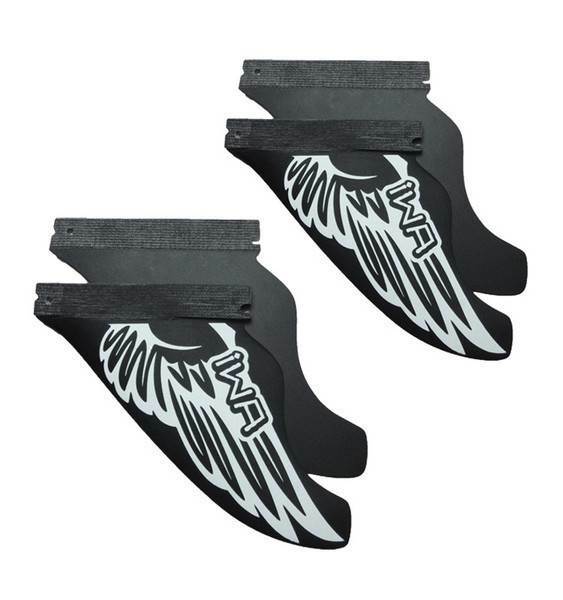 I found these kite specific weed surf fins online. They could be used on the Sector mini tuttle boxes with FCS adapters. They come in different sizes for both quad and tri fin. There's a 2 x 10.5 / 2 x 12 quad fin configuration that looks like it may have potential. The size is about right for the Sector. Btw, I know the Sector V1.5 resolved the issue @ the fin boxes, but I'm wonder if anyone has had issues with delamination. I noticed a bubble on the bottom (toward the front) of my friend's (almost new - he used it but a few times) Sector V1.5 60. I never left it in my hot car. Curious.